Here at Dataquest, we don’t usually think of ourselves as a data science “bootcamp.” We don’t have any classes you can attend in person. We don’t put you up in dorm rooms with other aspiring data scientists. And we don’t charge $15,000 or more in fees like many real-world coding bootcamps do. But Switchup, the platform that ranks coding bootcamps, has rated us the best online data science bootcamp. That got us thinking: while we didn’t set out to create a “bootcamp,” with the help of our students, we have effectively become one. Offline data science bootcamps get that name because like military bootcamps, they’re designed to push you through a lot of important training in a short period of time. The idea is that you can come in with nothing and by the end of the program three months later, you’ll have the basic skills you need for data science employment. Dataquest can work the same way. Of course, we offer a flexible, work-at-your-own-pace approach. But if you approach it with the seriousness of a bootcamp and commit at least 15 to 20 hours a week to your studies, you would be likely to finish our entire Data Scientist path in three months or less. Traditional data science bootcamps can achieve their high training speeds because their curriculum is carefully chosen, with a focus on the skills data scientists actually need to find (and keep) jobs in the field. The goal is that virtually none of a student’s study time is wasted on learning things they won’t need. Our carefully-tailored study paths include training in all of the technical skills required for data science employment. Our Python path, for example, includes training in Python programming, data visualization, pandas, NumPy, data cleaning, SQL, statistics, machine learning, natural language processing, Spark, and much more. It also includes a number of guided real-world data science projects you could use in a portfolio for job applications. One of the big advantages of data science bootcamps is that they typically offer hands-on, real-world-project-focused classes that aim to get you working with data from day one. For a lot of learners, this approach is more impactful than the traditional university model (a professor lecturing in front of a PowerPoint) and the traditional online model (a teacher lecturing over a video of them coding). At Dataquest, we take the same approach, because we agree that the best way to learn data science is to actually do data science: to get your hands on real-world data and start working with it as early as possible. Unlike a lot of MOOCs and other online options, our lessons aren’t video-based, because we want you to spend most of your time coding, not watching. All of our classes use real datasets to analyze interesting problems, and our guided projects offer additional opportunities for guided hands-on learning. Another selling point for real-world bootcamps is that they offer peer interaction. There’s definitely value in being able to ask questions and work on group projects with other aspiring data scientists. Plus, being able to work constructively with other data scientists is an important skill at many jobs, where you’ll need to work as part of a larger data team. Here, too, Dataquest can offer a “bootcamp” experience. Since we’re online-only, there’s no physical proximity to your peers, but our platform is carefully designed to facilitate student interaction through the Q&A tab, where users can ask and answer questions on every mission or browse through previously-asked questions sorted by how helpful others found them. And for paying subscribers, we have a community Slack, where users can interact to undertake group projects, ask questions, and network with each other and with other members of the community who have either completed or are completing one of our data science bootcamp-style paths. This is a big one. After all, it’s probably why you are considering a data science bootcamp in the first place: to get a job. Real-world bootcamps also sell students on their career counseling services, and it’s tough to overestimate the value of being able to sit down one-on-one with a data science professional and get their advice on job applications or their thoughts on your resume or portfolio. That’s something that Dataquest offers too, at least for our Premium subscribers. In addition to other perks like members-only help and support, Premium subscribers can book Office Hours with our data scientists to get valuable career counseling like resume reviews, portfolio advice, and general guidance on building a successful career in the data science field. Traditional data science bootcamps promise, and sometimes even guarantee, results. And while we would encourage all students to be skeptical of unaudited claims about the percentage of graduates who find jobs, there’s no denying that many bootcamp students really do go on to find cool jobs at promising companies in the field. That’s not unique to offline programs, though. Dataquest students have landed data science jobs at companies like SpaceX, Accenture, and Citibank, as well as trendy startups like Noodle.ai. You can check out some of our recently-featured success stories here; we also share them from time to time on social media. And of course, you can check out user reviews on sites like SwitchUp and Course Report at any time to see how satisfied students are feeling about our course offerings. Offline data science bootcamps definitely aren’t cheap. 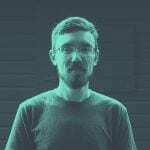 In fact, Switchup’s top-ranked offline bootcamps for data science (General Assembly, Metis, and Data Science Academy) all charge in excess of \$15,000 for their 12-week data science bootcamp programs. But that’s still affordable compared to the traditional alternative: four years of college study with average costs that range from \$40,000 (for in-state public university students living at home) to more than \$187,000 (for private college students living on campus). And that’s not even including the thousands most college students have to spend on books, transportation, and other miscellaneous costs! This, of course, is where Dataquest beats offline bootcamps at their own game. Because we don’t have to pay the heavy overhead associated with renting or owning physical spaces, our Premium subscription is far more affordable than the average offline data science bootcamp. At just \$399 billed yearly, you could take Dataquest courses for the next 37 years and still pay less than you would for many 12-week bootcamp programs. So yes, we have a lot in common with offline data science bootcamps. And yes, we’re currently ranked as the best online bootcamp in data science. So why don’t we call Dataquest a bootcamp? Because we offer more than that. Our subscription model offers ideal bang-for-your-buck if you want to put yourself through a rigorous three-month bootcamp-style program. But it also offers something more: ongoing access to our community and our ever-expanding library of courses. That’s one major downside of the offline bootcamps: while many provide excellent training, when the next popular package or industry trend comes along, you can’t go back to update your training. With a Dataquest subscription you can, because we’re regularly adding new courses and updating old courses to ensure that we’re offering the best possible training for working data scientists. So no, we’re not really a data science bootcamp. We’re more flexible than that. 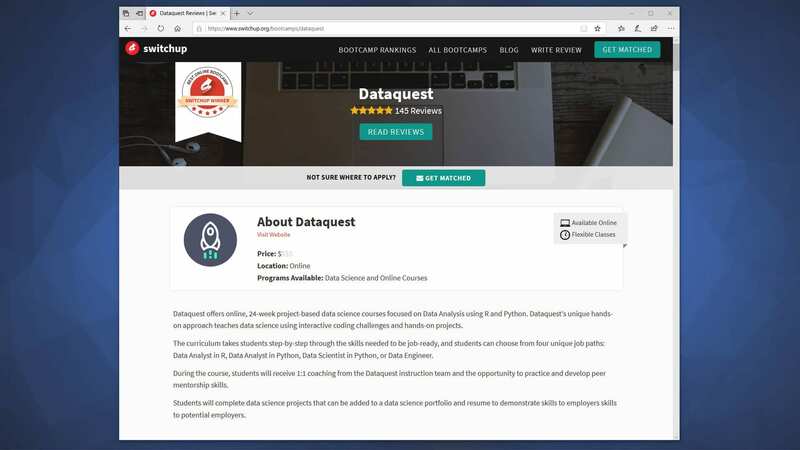 But if you’re serious about learning data science and you’re ready to commit, you can find everything you’d want in a top data science bootcamp right here at Dataquest, at a small fraction of the cost. Start your data science journey today.